I'm tired. I'm tired and I've had enough. God help the Australians when these women are turned loose on their country. And God help us too. I can see it now. Images of Oprah mauling koala bears, hugging baby kangaroos, and probably a teary-eyed speech about the Aboriginals while standing with a wallaby in front of Ayer's Rock. Right. I guess that must be all part of "Living Your Best Life." While looking through her website earlier, I saw something entitled "Oprah-fy Yourself!" I'd heard of "Oprahfication" which http://www.urbandictionary.com/ defines as "the ability to apply oprah's favorite doctor, celebrity or personality to your own life to make you a "better" person...only in oprah's eyes..."
but I'd never heard of "Oprah-fy." Oh! What fun! I get to superimpose my face onto Oprah's head and shoulders. It doesn't get more exciting than this! Luckily this is Oprah's final season. In fact, at the time of writing her show will be officially over in 11 months, 23 days, 13 hours and 17 minutes. It can't come soon enough for me. If I'm really lucky, maybe she'll be eaten by a dingo. Funny you should say that....I was just thinking about that this morning. But, I'd probably be lynched by all the Oprahfans (one word) as soon as I left the studio. 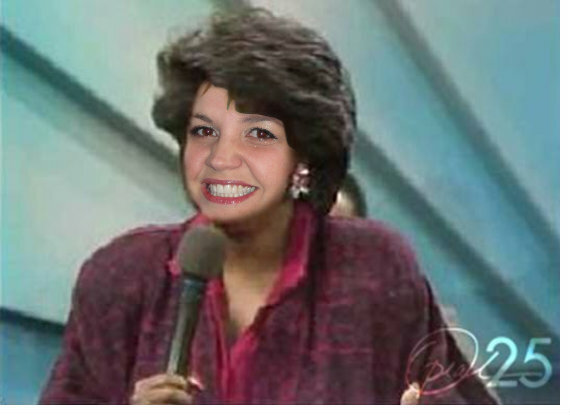 I did the Oprah-fy thing too!